Advance Text Messaging Software sends large number of sms to individual or a group from computer system to other mobile phone devices via using GSM and Windows based handsets. Bulk Messaging Software supports sending National or International sms on all major Mobile Phone Networks from your PC to group of mobile phones using Microsoft Windows OS based Pocket PC, PDA, Smart phones devices. Affordable Bulk SMS software is computer based application where user can load contact numbers manually or import from Phone Book memory of your Mobile Phone. Easy to use SMS Messaging Tool sends text messages including bulk sms for any contest, price alerts, account info, invoice details, stock updates, meeting schedules in the easy way. • Send SMS to single or multiple phone numbers in a short time span. • Supports all major Microsoft Windows OS based Pocket PC, Smart phones or other mobile phones. • Capable to send sms at all National or International Mobile phone networks. • Delayed delivery option to minimize the load of sending SMS. • Save sent sms details at specified location on the computer system. • No hidden cost, setup fees or any installation charges. • Easy, safe, non-destructive and read only utility with user friendly GUI interface. Synchronizing your phone with your PC is easy way to transfer information, settings, and files. Synchronization is handled with different applications for Windows XP, Windows Vista and Windows 7 or higher operating systems. So please check which operating system your PC is running and choose the appropriate option listed below. 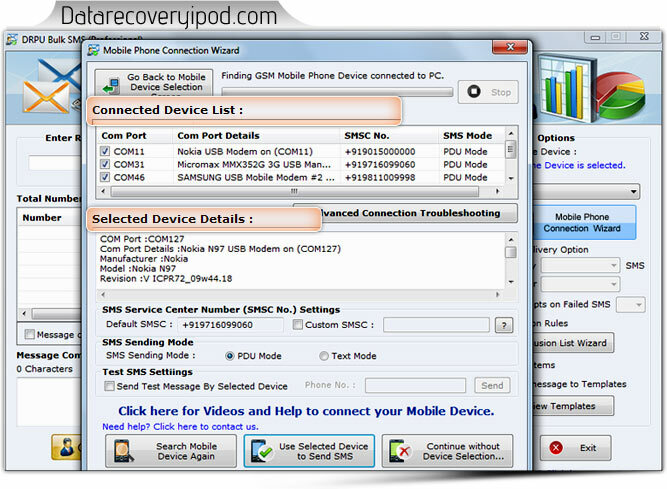 • If computer system is running on Windows Vista, Windows 7 or higher operating systems then synchronization settings will be managed through Windows Mobile Device Center. • If computer system is running on Windows XP or earlier then synchronization settings will be managed through Microsoft ActiveSync.